At one time the Winter Gardens at Morecambe, a seaside town in Lancashire, was one of the most important small hall venues in British boxing. Between 1928 to 1964 no fewer than 644 professional boxing promotions were staged there and men of the calibre of Jock McAvoy, Frankie Taylor, Johnny King, Jackie Brown, Frank Johnson and Jimmy Walsh all fought there. 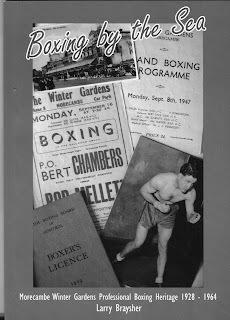 Larry Braysher, one of Britain’s leading boxing memorabilia collectors and a local to the area, has recently published a fine book which tells the story of this famous boxing venue. ‘Boxing by the Sea’ is available direct from the author for £10.90 + £2.50 post and packing. The book has many attributes and these include the many excellent items which Larry has selected for reproduction from his collection, particularly some marvellous photographs, programmes and handbills. Larry has also sought out a number of the surviving boxers from Morecambe and Lancaster who fought at the Winter Gardens and, through them, he tells the story of how the venue thrived throughout the 1940s and 1950s. Another strong point is the inclusion of around 20 boxing records for many of the lads from in and around Morecambe who boxed at the Winter Gardens many times. Most of these records have never been published before and they make a useful appendix to the text. The book also tells the story of the visit of future World heavyweight champion Primo Carnera, who boxed an exhibition at Morecambe in 1931, the sad story of the only ring fatality to ever take place at the venue, and has pen pictures of many of the leading ex-boxers who refereed at the hall. First of all sorry not to have responded earlier to your concerns about your granddad Ronnie NELSON’S lack of recognition in my book ‘Boxing by the Sea’. Sadly what happened here was something that I dreaded occurring whilst I was researching the book, and that was that a boxer of note or his family would eventually make contact with me, but after the book had been published. That unfortunately was what had transpired when Ronnie’s widow, Mrs. NELSON, got in touch with me after its publication. This was extremely disappointing from my point of view, as during the course of my research I had made appeals in the Lancaster Guardian (4th August 2011) and the Morecambe Visitor (24th August 2011) for former boxers or their relatives to get in touch with me with a view to including them in the book. As a result a number of people made contact and that is how I got in touch with Ronnie’s brother Billy. It was therefore a shame that neither Mrs. NELSON, yourself or any of your family saw the appeals that were carried in these local newspapers. Although you make reference to Ronnie being a better boxer than Billy and having won more titles (as an amateur), this is something that I cannot judge as I never saw either of them box. However I do know that they were both good amateurs as junior boxers for the Red Rose Club and both turned professional at seventeen years of age, albeit three years apart. Their professional records though are a matter of fact, and Ronnie was active between 1950 and 1951 and had 7 professional contests boxing as Ronnie NOON. He was then inactive for eight years until he made a come-back in 1959 and had a further 4 contests boxing this time as Chris NELSON, before retiring from the sport with a record of 11 professional bouts in total. His brother Billy was active as a professional between 1953 and 1960 and during that time he had 56 contests. Nothing would have given me greater pleasure than to have featured Ronnie more prominently in my book and to have consulted Mrs. NELSON regarding his boxing career, but due to circumstances that I have already mentioned this was not possible. However I hope Ronnie’s several mentions in the book, however brief, are of some small consolation. My admiration for anyone who puts on a pair of gloves and boxes for pay in this hardest of sports is total. In addition there is something that I hope you do not overlook despite your natural disappointment, and that is the dedication at the front of the book which is to all the professional boxers who appeared at the Morecambe Winter Gardens. A very select group of men amongst which your Granddad is rightly included and a fact that you are no doubt justifiably proud."